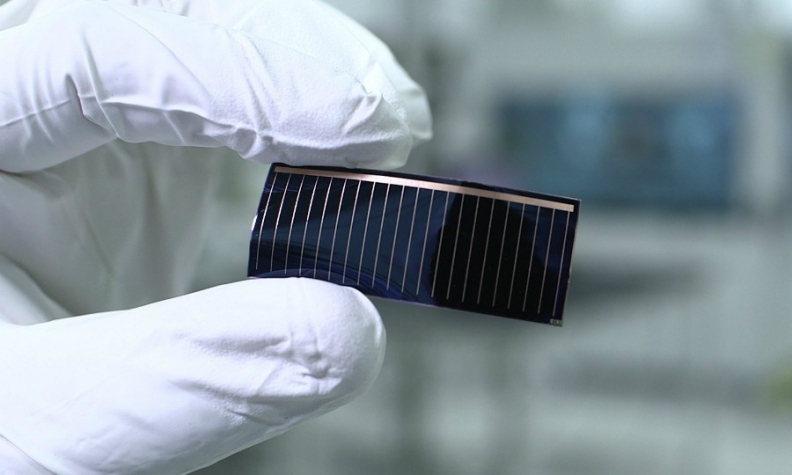 A worker holds thin-film solar cells that will be used in Audi's panoramic glass roof. BEIJING -- Audi is working with China's Hanergy Thin Film Power Group to integrate solar cells into panoramic glass roofs for upcoming Audi electric vehicles. The prototype of the vehicle with a solar roof will be built by the end of this year, Audi said, without giving any details on investment and estimated time frame for mass-production. Integrating Alta Devices’ thin-film solar cells into a panoramic glass roof would be a first step. In the future, almost the entire roof surface would be covered with solar cells. The electricity generated would flow into the car’s electrical system to supply devices such as the air-conditioning system or the seat heaters – a gain in efficiency that has a "direct positive impact on the range of an electric vehicle," Audi said. "That would be a milestone along the way to achieving sustainable and emission-free mobility," said Bernd Martens, Audi's procurement chief, in the statement. Audi, which has been grappling with car recalls, prosecutor investigations and persistent criticism from unions and managers over an emissions scandal, is currently looking to shift its focus to EVs. Last month, Audi said it aimed to cut costs by about $12 billion by 2022 to help fund the shift. It is also looking to free up funds for investments in zero-emission technology by developing a new production platform with Porsche, allowing both VW brands to save money by sharing components and modules. The partnership adds the two companies to a growing effort to use photovoltaics on more car roofs. Japan's Panasonic has started producing a 180-watt array of solar cells able to be fixed to the roof of an automobile. Meanwhile, Nissan offers an add-on solar panel option for its Leaf electric car.